On Monday, Facebook eliminated many extremist pages from its platform, including several Canadian pages, such as those of extremist groups Soldiers of Odin, the Canadian Nationalist Front and Aryan Strikeforce, as well as individuals like white supremacists Faith Goldy and Kevin Goudreau. Some anti-racist activists say it’s a good start, but only the tip of the iceberg. They also assert that occasional purges of hate content will not address the larger issue in the absence of clear, enforceable standards by social media giants like Twitter and Facebook, which also owns Instagram. Relatedly, the Centre for Israel and Jewish Affairs has launched a campaign, #notonmyfeed, which is intended, according to the accompanying website, “to stop online hate from becoming real-world violence.” (See jewishindependent.ca/cija-fights-online-hate.) CIJA cited social media posts by the murderers in the Pittsburgh synagogue and the Christchurch mosque killings as cause for governments to move on the issue. The House of Commons justice committee – as if they are not busy enough with the SNC-Lavalin affair – is launching a study on the issue. The intent, according to CIJA, is to develop a national strategy around online hate. A national strategy confronting hatred, whether online or offline, seems like a positive development if it helps track problematic people and ideas in order to prevent future violence. The benefits of a crackdown on online hatred are obvious: by making it more difficult for hateful ideas to reach large, mainstream audiences, moves like those by Facebook are a positive step. Groups that use social media to recruit individuals into hate movements may be hobbled by such policies. Although there are plenty of forums online where they can continue their efforts, hate groups may not have as easy and accessible a reach if policies are put in place to monitor and censor such groups and their messages. Of course, some of the extremists are crowing about being banned. True enough. But if we make Goldy’s job harder, it’s a good thing. However, while there are potential positive outcomes, we should not be blind to the potential unintended consequences of such a move. If the murderers of Pittsburgh and Christchurch had given hints on social media of their intent, isn’t the larger issue here that those threats went unchecked and, therefore, the perpetrators were allowed to complete their mission of mass murder without intervention? Do we really want to eliminate forums in which we can track and identify potential terrorists? If we ban them from these platforms, are we forcing them underground into places where we cannot police them? Presumably, police and intelligence agencies know where to find the online warrens of hatemongers and can monitor those venues almost as easily as they could Facebook or Twitter, while ensuring that members of the public who are innocently surfing the web do not stumble upon violent hate messaging in seemingly innocuous places. Even so, given that, as CIJA points out, the Pittsburgh and Christchurch killers left a trail on social media and still managed to execute their terrible plans, it suggests we’re not doing a stellar job on this front even when the warning signs are on the world’s largest sharing platforms. So, how much better are we to expect things to be when we force them into the darker crevasses of the online world? 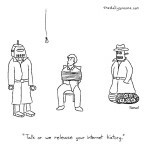 This issue is confounding in part because the internet is, by definition, anarchic and largely beyond the control of all but the most authoritarian governments. As a result, governments and even social media behemoths like Facebook can do only so much to control what is shared through the web writ large. Leaving aside issues of free expression (which differ across jurisdictions in ways that social media do not), there are practical considerations that we hope elected officials, law enforcement and social media corporations themselves consider when addressing online hate. As governments do begin to take the issue seriously and consider interventions in the interest of public safety (including, especially, the safety of the most commonly targeted identifiable groups), we trust that a balance will be struck between eradicating violently hateful messaging, on the one hand, and, on the other, not harming law enforcement’s ability to do their job by pushing these ideas into clandestine sectors where they can neither be monitored nor challenged. Finding that balance should be the key to formulating public policy on this urgent issue. Israel’s Ministry of the Diaspora recently announced what it calls the most advanced system of its kind in the world to track antisemitic content on social media. The Anti-Semitism Cyber Monitoring System, or ACMS, can find relevant posts that are antisemitic (using the definition devised by the International Holocaust Remembrance Alliance) on Facebook and Twitter in English, French, German, Arabic. It can see who posted and shared the comments. Other languages and social media platforms are expected to be added to the system as it progresses. In a month-long trial run, the system identified 409,000 antisemitic posts by 30,000 individuals. Whether the system can or cannot catch every instance of antisemitism online is less significant than the fact that it is a tool to identify trends. In the trial, the system identified the world’s “most antisemitic cities” as Santiago, Chile; Dnipro, Ukraine; and Bucharest, Romania. Western cities that topped the online antisemitism list were Paris and London. This is relevant research. It would be useful to know where Vancouver or Canada falls in such a ranking. That kind of information could help our community work with governments and other agencies to address the topic and devote resources to education and countering hatred. Anyone who has spent time online and confronted the sorts of nastiness that exists there might find a sort of satisfaction at the idea that some of the people who are purveying the worst Jew-hatred will no longer get off scot-free. But let’s take a step back. It is one thing for an intelligence agency – or a responsible nongovernmental organization such as the Southern Poverty Law Centre – to accumulate information like this for the purposes of research, monitoring dangers and notifying appropriate authorities. It would be quite another if, as Bennett seems to suggest, a government (or other agency) were to make public an online database of people who express offensive or racist comments online. The site is a compendium of individuals who have made comments online or been seen at events of various types and includes links to their LinkedIn, Facebook, Twitter and other social media pages. Some of the comments Canary Mission has assembled are indeed disturbing. “I swear if [a] Jew gets within 5 feet from me at the protest and says a word, straight murder,” one person wrote. “Ima kill a jew in a month,” wrote another. There is also no doubt that, among these people, most of whom are university students, are some who have been drawn into anti-Israel movements and have made, as many of us do, occasional untoward comments on social media. 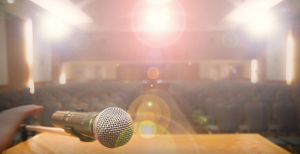 It may be fine to call these comments out, but it is not acceptable to assemble in one place a group of people who vary widely – from those who should be reported to authorities for posing a danger to society to some who are probably legitimately attempting to make a peaceful political statement, however misguided we may think that message is. This approach encourages vigilantism. It is the sort of tactic that has been used in the past by anti-abortion terrorists who have murdered or attempted to murder healthcare providers, including one right here in Vancouver who was shot through a window in his home. Consider – and there is absolutely no reason to view this as far-fetched – that a website was set up to aggregate information about you, your parents, your children and anyone else you know who has traveled to Israel, donated to Zionist causes or attended pro-Israel events. There are a lot of irrational people in the world and a project like this could help them act out in potentially catastrophic ways. Again, there is value and importance in accumulating this information. It should be shared with relevant authorities, including the universities, police, FBI, CSIS and so forth. But we should not be encouraging the public dissemination of this material. It is an extremely hazardous game. Born and raised in Toronto, Renny Grinshpan is the daughter of an Israeli-born dad and a Toronto-born mom. Her sister, Eden, works as a host on the food scene in Canada and the United States and recently hosted Top Chef Canada. For her part, Grinshpan is a bit of a celebrity herself – in Israel. After finishing high school in Toronto, Grinshpan moved to New York City, where she studied history at New York University before heading to Columbia University to pursue her master’s in journalism. After six years in New York, she moved to Tel Aviv to be with her Israeli partner, Hadar Amar, and they still live there. This past June, the couple was married. Grinshpan became known in Israel’s comedy scene for her role on HaIsraeliot (the Israeli Girls), a Facebook page with female Israeli comedians, including Leah Lev and Meital Avni. In her Facebook videos, Grinshpan delves into different aspects of Israeli culture from a Canadian perspective. As a relatively new olah (immigrant), these observations come naturally for her. Grinshpan gained experience in video during her journalism studies at Columbia, where she focused on video journalism and learned how to film, edit and build a narrative visually. “I made several short documentary-style videos that year and the year following,” she said. 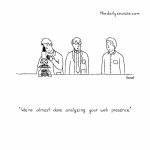 “When I worked at Tross, I got experience writing creatively for the first time – writing scripts for product and crowdfunding videos for start-ups. Grinshpan has spent some time as a visitor in Vancouver and had much good to say about the experience. “I love Vancouver!” she said. “Thank you for giving me some of the best times! Looking ahead, Grinshpan said she dreams of co-hosting a food and travel talk show across Israel or Canada with her big sister one day. To follow or see more of Grinshpan, visit facebook.com/heyitsrenny or check out youtube.com/watch?v=d9pPtsFplaI and youtube.com/watch?v=nYKvpVlOVmU. On Nov. 24., writer Penny Goldsmith spoke at King David High School about PovNet, a B.C.-based anti-poverty network. 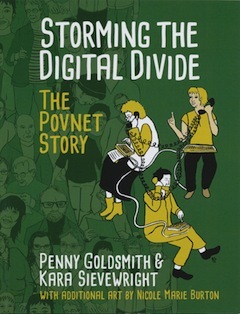 When Storming the Digital Divide: The PovNet Story was published in August by Lazara Press, the Jewish Independent received a copy. A history told in words and through illustrations about the B.C.-based online anti-poverty community network, the JI waited until school started, as it seemed the perfect topic for King David High School teacher Aron Rosenberg’s social justice class. And it was. Once students were into the rhythm of classes and the High Holidays had passed, Rosenberg met with Penny Goldsmith – PovNet founder and a longtime community organizer and advocate – to determine how to address the subject. Goldsmith wrote Storming the Digital Divide, while B.C. artist, writer and activist Kara Sievewright – who has been PovNet’s web coordinator and illustrator since 2005 – created the images, and there are additional drawings by artist, researcher and educator Nicole Marie Burton of Ad Astra Comix, which publishes comics with social justice themes. For Goldsmith’s presentation, students were asked to consider their chosen bubble with respect to a few questions: “What does the information in the bubble mean for poor people? For anti-poverty advocates who work with them? For you?” Divided into groups, a table spokesperson shared some of the thoughts that arose from the brief group discussion of the questions. Student Leora Schertzer, in her role as master of ceremonies, made sure that every student who wanted to contribute aloud was invited to do so. Once the students had a chance to think about the issues, Goldsmith offered her thoughts, using portions of the book, beginning with an explanation of its title. “From trying to get a job, finding adequate housing and accessing government services … to networking with fellow advocates and fighting for social change, the internet is now at the very least an essential service,” said Goldsmith. Regarding the accessing of government services, she gave the example of qualifying for welfare, which requires the completion of a 90-screen online application. She offered a few definitions. “Collins English Dictionary defines the digital divide as ‘the gap between those people who have internet access and those who do not.’ Simple,” she said. “Dictionary.com expands the definition to include ‘the gap between those who are computer literate and those who are not.’ An important addition. Other dictionaries expand the definition to include marginalized communities in developing countries. A lack of money is not the only barrier to internet access. It is these barriers that PovNet also works to diminish. “PovNet is an online community of social justice advocates, activists, community workers and marginalized people who work in the anti-poverty world in British Columbia and across Canada,” said Goldsmith. “It hosts a public website that provides up-to-date information about welfare, housing and homelessness, unemployment, disability and human rights issues. “PovNet’s community of users is vast,” she continued. “A disability rights organizer in Nelson goes to the PovNet website to get some information for a community workshop she is doing that night about changes to disability bus passes. A tenant in the Lower Mainland of Vancouver goes online to find an advocate to help him deal with a landlord trying to evict him. Several workers at a women’s centre in a small northern British Columbia town sign up for an online course at PovNetU about dealing with debt because they have so many clients coming into the women’s centre who are being harassed by a local collection agency. Storming the Digital Divide contains many illustrated stories from the online anti-poverty community, which bring the facts and figures closer to home, as well as the impact of PovNet over the 20 years since it began in 1997. While Goldsmith is no longer the organization’s executive coordinator – a post she filled for 18 years, until 2015 – she remains passionate about its work. And some of it rubbed off. Here are some of the comments students wrote after her talk. Storming the Digital Divide ($12.95) is available from lazarapress.ca. ראש ממשלת קנדה מטעם המפלגה הליברלית, ג’סטין טרודו, חטף לראשונה ביקורת קשה מאוד מבית ומחוץ, לאור תמיכתו הנלהבת במנהיגה לשעבר של קובה, פידל קסטרו, שנפטר ב-25 בנובמבר. רבים ממנהיגי העולם המערבי בהם ארה”ב וכמובן מנהיגי האופוזיציה (מהמפלגה הקונסרבטיבית) לממשלת טרודו בקנדה, ביקרו אותו קשות לאור הדבריו שאמר לזכרו של קסטרו. המועמד לנשיאות בארה”ב מטעם המפלגה הרפובליקנית, מרקו רוביו (שהפסיד לדונלד טראמפ), הגדיל לעשות כשאמר: “האם הצהרה זו אמיתית או פרודיה? כי אם זה אמיתי זה מביש”. ואילו פרשן יחסי החוץ של הוול סטריט ג’ורנל, ברט סטיבנס, העיר: “הודעה מחפירה של ג’סטין טרודו. לא ג’סטין, פידל לא ‘שירת’ את העם הקובני. הוא הפך את העם למשרתיו במשך 60 שנה”. המנהיג הקובני היה ידידו של אביו פייר אליוט טרודו, שהיה המנהיג המערבי הראשון שביקר אותו באי ב-1976, מאז משבר הטילים עם ארה”ב והאמברגו האמריקני. קסטרו לא שכח וב-2000 הגיע להלוויית טרודו במונטריאול. טרודו הבן מיהר לצאת בהצהרה כתובה לאחר שנודע שקסטרו נפטר. בה אמר בין היתר: “פידל קסטרו היה מנהיג גדול מהחיים, ששירת במשך כמעט חצי מאה. היה מהפכן ונואם אגדי, שהביא לשיפור עצום במערכת החינוך וכן מתנגדיו הכירו בהתמסרותו ובאהבתו האדירה לעם הקובני, שרחש חיבה עמוקה ומתמשכת למנהיג”. האמנם טרודו? מומחה לנושאי קובה וקסטרו, הסופר ובמאי הסרטים, ירון אביטוב, שחי בעבר בקובה, כתב בימים האחרונים רשימה על קסטרו שפורסמה בעיתון מעריב. בין היתר כתב אביטוב: “קסטרו היה אחד העריצים האכזריים ביותר בתולדות המאה ה-20 ונחשב לאכזר ומרושע. הוא רדף את מתנגדיו ורבים הושלכו לכלא ונמקו שם, בעיקר סופרים ועיתונאים. לאורך השנים מאות אלפים גלו מקובה, או ניסו לברוח ממנה למיאמי ברפסודות רעועות, וחלקם נטרפו על ידי כרישים. את הבשורה המהפכנית, שהייתה אמורה לשמש מודל וחיקוי במאבק נגד האימפריאליזם, השחיתות והסיאוב, המיר קסטרו ברודנות מושחתת ומסואבת, שרק מרקסיסטים עיוורים עוד דוגלים בה. במהלך כהונתו העשיר קסטרו את קופתו הפרטית על חשבון העם שהסתפק בנזיד עדשים, עד שזכה להיכלל ברשימת מאה עשירי העולם של המגזין פורבס. קסטרו הפך את קובה לאחת המדינות העניות המרודות בעולם. מדינה שרוב תושביה משתכרים סכומים שלא היו מספיקים לרכישת פלאפל ברחוב דיזינגוף. רוב תושבי קובה מתחננים בפני תיירים שירכשו עבורם תרופות שאין להשיגן, לא מעט מבנותיה מציעות את מרכולתן בשוק הבשר האכזרי, מדינה שסובלת מהפסקות חשמל ומים תכופות, מרבית אוכלוסייתה ניזונה מפנקסי קיצוב וכל אדם שפותח את הפה עלול להיות מושלך למאסר ממושך, ואף גרוע מכך”. לאור החשש ממדיניותו הבעייתית והמסוכנת של הנשיא הנבחר של ארה”ב מטעם המפלגה הרפובליקנית, דונלד טראמפ, ארכיון האינטרנט האמריקני החליט ליצור עותקי גיבוי לעת חרום בקנדה. בהנהלת הארכיון הדיגיטלי חוששים כי טראמפ מסוגל להפעיל צנזורה קשה שתפגע בחופש הפעולה שלהם, ולכן הוחלט ליצור ‘אתר ראי’ שלא במפתיע ימוקם בשרתים הקנדיים שמעבר לגבול. עלות יצירת עותקי הגיבוי בקנדה תעלה מיליוני דולרים והארכיון מחפש עתה מקורות מימון ותרומות, להפעלת הפרוייקט המסובך. הארכיון הדיגיטלי האמריקני (שהוא ארגון שלא למטרות רווח) פועל מזה כעשרים שנה, ומאחסן כל העת עמודי רשת. יצויין כי מדי שבוע הארכיון גדל בכשלוש מאות מיליון עמודי רשת חדשים, שכוללים ספרים, סרטונים, תוכנות, מוסיקה ועוד. For more cartoons, visit thedailysnooze.com. At any given time, but especially in recent weeks when Israel’s conflict with Hamas has been front-page news, a perusal of the comments under any story involving Jews almost inevitably devolves into some variation on the theme of Jewish control. It is notable how frequently, even in 21st-century Canada, Jews are depicted as manipulating the media and puppet-mastering the powerful, like the United States. The advent of the electronic age has brought the phenomenon to even greater levels of intensity. We are now all broadcasters. We are all publishers. We are all curators of the news. A few years ago, the vast majority of North Americans gathered their information from the same couple of sources. While every city and town had its own newspaper, these mostly received international news from the same few press agencies. On television, Canadians were offered CBC or CTV. We now have access to hundreds of English-language TV stations and millions, if not billions, of other sources for whatever information we seek. News, which was once a staid medium, has morphed into infotainment, in which beheadings in Iraq mingle with Kardashian marriages. Time was, one could count on the fact that most of the people at your dinner party would have heard what Barbara Frum had said the previous night or would catch the reference to a Wayne and Shuster skit. Now, if you don’t “get” the references, an electronic device will promptly be provided so that you can watch the original source of the reference itself. It is true that social media has helped young people – all people – take up causes and devote themselves to social change if they seek to do so. One of the greatest examples was this summer’s ubiquitous Ice Bucket Challenge, which has raised millions of dollars for ALS research and advocacy. Still, there is a diminishing of comprehensive, shared, reliable news and information upon which all people form their opinions. In a democracy, everyone has the same voice at the ballot box. But a democratic society is not formed only on one day every four years. A thriving democratic society requires the engagement of an informed population every day. From that perspective, democracies risk losing an important element of viability and vibrancy when a huge proportion of the population is choosing the garden channel over Newsworld, TMZ over the New York Times. For centuries, there has been the conspiracy theory that a tiny minority somehow controls knowledge and everything that goes with it. In a strange way, this myth may be approaching reality. But it is not Jews who are the elite increasingly controlling what transpires in the world – it is the diminishing number of people who are actually paying attention. This is not, like the conspiracy theory, the effect of a minority seizing control from the masses. It is the opposite: it is masses of people abdicating their right and responsibility to be informed, active participants in democratic society. And, as more people look away from the uncomfortable realities of the world, a smaller and smaller elite – those who choose to remain informed – will have an outsized influence on public opinion and what governments do worldwide.